In this video we will discuss angular optional URL parameters. Let us understand this with an example. Here is what we want to do. On the list of students page, we want to search employees by name. 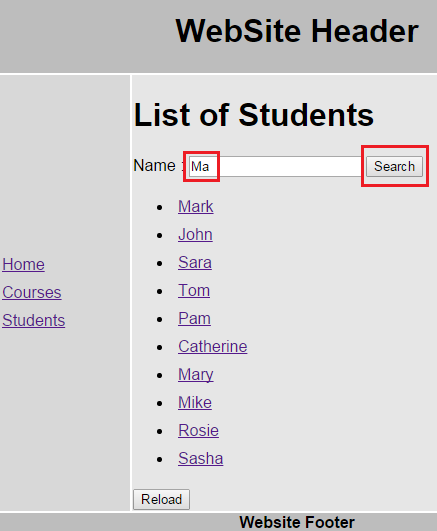 For example if we type "Ma" and click search button, on the subsequent page we want to display all the student names that start with "Ma" as shown below. 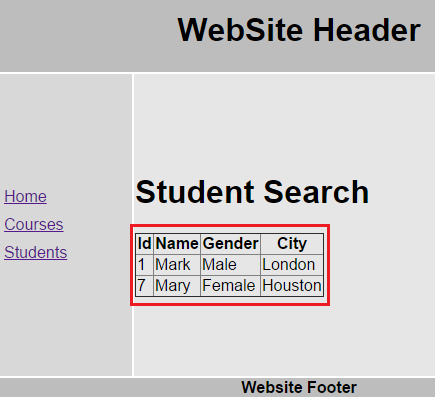 Step 1 : Add a method to the asp.net web service to retrieve students by name from the database. Value = name + "%"
Step 2 : Modify studentsController function in script.js to include studentSearch() function. This function needs to be called when the Search button is clicked. Step 3 : Modify students.html partial template in Templates folder as shown below. Step 5 : Include a new route for searching students in script.js. To make a parameter optional, all you have to do is include a "?" at the end. Step 6 : Add a new HTML file to the Templates folder. Name it studentsSearch.html. Copy and paste the following HTML.